Most UNSC military vessels, such as the UNSC Infinity, are armored with Titanium-A plating. Titanium-A armor is the most common form of battle plating used by the UNSC on its warships. It is composed of high-grade Titanium-50 that is specially strengthened at the molecular level, which implies alloying with other elements. It is usually greyish in color, and is embedded with thermal superconducting radiators to more efficiently transfer the heat generated by the ship into space. Following the Human-Covenant War, some UNSC military vessels received energy shielding to allow the ships to absorb more damage. Like the Magnetic Accelerator Cannon, Titanium-A armor plating saw advances and widespread use due to the Insurrection. The UNSC Savannah's hull holding its own against the Ardent Prayer, despite being severely outgunned. Titanium-A has numerous uses throughout the UNSC due largely to titanium being lightweight and extremely strong, with a high tolerance to heat. Its primary use is armor for ships. Typically, as much as one-third of a standard UNSC military vessel's mass is the Titanium-A plating. UNSC frigates have sixty centimeters of plating on their hull, UNSC destroyers have up to two meters of plating and UNSC carriers have thirty-six centimeters of Titanium-A plating. Marathon-class heavy cruisers have 191 centimeter-thick layers of Titanium-A armor, allowing them to sustain far greater damage. D77-TC Pelicans and GA-TL1 Longswords are both covered in Titanium-A armor to provide additional protection in dogfights. Slipstream space probes are almost solid Titanium-A to allow them to survive the stresses of frequent slipspace entries and exits. Long Range Stealth Orbital Insertion Pods are given additional Titanium-A plating to allow the pods to be launched from slipspace. Refit stations and construction platforms, such as Station Delphi, are essentially slabs of Titanium-A armor plating. The UNSC uses Titanium-A for construction of military bases as well, to make them less susceptible to destruction. Underground facilities such as HIGHCOM Facility Bravo-6, CASTLE Base and Camp Hathcock used Titanium-A armor in their superstructures. Even lockers used by UNSC personnel are reinforced with a centimeter of Titanium-A armor plating. Eridanus Secundus, a United Rebel Front asteroid base located in the Eridanus system, was reinforced with a layer of Titanium-A armor which also helps deflect UNSC and Covenant sensors. The UNSC Grafton is destroyed by a single energy projector shot. Prior to the Human-Covenant War, a single Magnetic Accelerator Cannon slug was capable of penetrating any vessel's Titanium-A armor plating. The armor took a newfound importance after the beginning of the Human-Covenant War: to contend with the Covenant's plasma weaponry, humans needed armor that would withstand the heat of the directed plasma. 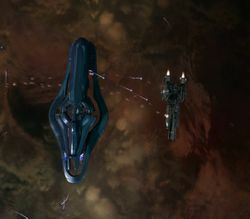 Despite its strength and resistance to heat, however, the Titanium-A plating is usually boiled away within seconds on contact with Covenant plasma torpedoes, and does not effectively dissipate the plasma. Energy projectors are able to pierce dozens of centimeters with relative ease. Pulse laser turrets can reduce the hull of a Paris-class heavy frigate to about four centimeters in a single hit. Even energy swords can do significant damage to Titanium-A armor. During the Fall of Reach, the UNSC Grafton was destroyed by a single shot from the Long Night of Solace's energy projector. Despite being armored with the stronger Titanium-A3 armor, the UNSC Infinity's hull was pierced by a Covenant mercenary space station's glassing cannon. After three hits from the cannon, the Infinity was nearly destroyed. However, the UNSC Savannah was able to hold its own for a while against the much larger Ardent Prayer, despite being severely outgunned. Molecularly-reinforced Titanium-A armor is typically employed alongside thick layers of elastic polymers and intermetallic laminate , allowing the host ship to mitigate both kinetic and energy-based attacks. The space between the armor plates is filled with shcok-hardening fluids an encapsulated healing agents to reduce spall from impacts and automatically seal small hull breaches. Titanium-A armor plating can be layered with tungsten for a radiation absorption rating of 5 and presumably grant greater protection against plasma weaponry. Unlike the Covenant's nanolaminate hull plating, Titanium-A plating is not effective during direct collisions with other vessels. After a direct collision with a CPV-class heavy destroyer, the UNSC Spirit of Fire was heavily damaged, while the destroyer was seemingly unharmed. When the destroyer UNSC Iroquois collided with a Covenant stealth ship, the Iroquois lost all two meters of Titanium-A plating, although it did succeed to disabling the Covenant vessel. Titanium-A3 is a variant of Titanium-A battle plate developed by ONI's Materials Group. Like Titanium-A, it is chemically altered on the molecular level to produce a stronger plate for ship hulls. It has only been noted to be used on the UNSC Infinity, whose hull is composed of 4.9-meter-thick Titanium-A3 battleplate. The UNSC Spirit of Fire is heavily damaged by a collision with a Covenant destroyer. The UNSC Pillar of Autumn's modified hull is damaged by plasma turrets. The UNSC Infinity's unshielded hull is pierced by a glassing station. Two Charon-class frigates hulls are easily destroyed by plasma turrets. A Longsword's hull is made up of Titanium-A armor. A Marathon-class heavy cruiser's hull being pierced by a CAS-class assault carrier's energy projector.